If you've followed my work at all you know how thankful I am to have had such amazing, kind, wonderful brides! I can honestly say I've never had a "Bridezilla," I've never been treated unfairly, and I've remained friends or at least in touch with my past clients. From what I hear this is a rare gift and I am so grateful for it! I feel invested in not only the actual footage I shoot on their wedding days, but the stories I capture and the marriages that begin. But something else happens when it's the wedding of someone I know personally. And before you think I'm about to say I don't do weddings for friends and family because I'm worried about relationships and the strain it may cause... I feel totally the opposite! Something else happens when I have the privilege of shooting the wedding of someone I know. Something more. This summer, I shot engagement photos for some of my friends. I shot wedding photos for some other friends. And in September, I was able to shoot the wedding video for my cousin Katie! Getting to "work" with some of my favorite people in the world was a dream. And not just because they're far more likely to do whatever I ask them :) Having that much more insight into the bride's personality makes the day even more fun. Having a personal connection to the couple makes me light up even more than I usually do during my editing process. And Katie and Eric, I hope this makes you light up even more than that! Love you guys. ...And it just so happens that Sloane brought cake! Sloane and Michael were married on September 24, 2016 at the Mitchell House in Lebanon, Tennessee. What Does a "Getting Ready" Clip Look Like? The one type of footage that I find brides on a distinct side of the fence about is "getting ready" footage. They either can't wait to see it or don't want it at all. And I understand why: in order to have a videographer present when you're getting ready, you'll need us there at least an extra 90 minutes early (and in many cases, 2+ hours early). That's because the girls start getting ready long before the ceremony in order to have plenty of time for photos, makeup and mimosas! Additionally, some brides don't think these moments beforehand make for the most glamorous footage. I totally get that as well and it's personal preference! If you book an appropriate package, you could choose to have these moments not only in your highlight reel, but also on your final DVD or hard drive. In effort to give you a better expectation of how this clip turns out, I've posted the first 2(ish) minutes of my darling bride Harley's "getting ready" clip. As you'll see, this is not as polished as a highlight reel - it's more documentary style. I'll start out with some glimpses of hair, makeup, the dress, etc. set to music chosen by the bride. Then, as we get into more interesting, candid moments, I'll bring the music down so you can hear the dialogue that was happening in the room. For purposes of this clip (and Harley's privacy!) I edited her getting into the dress down by quite a bit for this online sneak peek. I'm still putting Harley's highlight reel together, and while I will probably use a few of these shots there, I won't use most of them and you can probably see why. If you value this type of footage, it's nice to have a stand-alone clip on the DVD since there is obviously more going on than I could ever fit into a highlight reel! Hopefully this will give you an idea of what to expect if you invite us to "get ready" with you! This clip is always included in the Wedding Weekend package, and depending on your day-of timeline and how you want to use your hours, you could also have it in the Wedding Day package. I'd love to hear from you to discuss the possibilities! Brandi's hair, makeup, dress and accessories were, in my opinion, perfection. She absolutely sparkled. It took a few people to get her puffy skirt on just right, and I was able to capture some of that comedy for the highlight reel. As she walked down the aisle toward Darrius, he looked so proud! But it was the reception at Millennium Maxwell House Hotel that really took my breath away. Chris and I had never been to this hotel before, and it's beautiful! Brandi and Darrius had rented out the ballroom on the top floor, and the sunset view of Nashville was magnificent. We felt lucky to be there! And the flowers. Oh, the flowers! There was a gorgeous arch of hundreds of flowers hanging over the head table, and each round table had romantic clusters of tall and short bouquets. Brandi was sweet enough to include a place setting for us and the photographer for the meal, and the staff took exceptional care of us. The gesture was so appreciated, and I'll never forget that Brandi was so thoughtful to do that for us! I'm kind of a sap. When it comes to weddings there are several moments that I have to watch out for. Yes, even when I am shooting them, and my husband/second shooter/Chris teases me for it. One that always gets me is the Father-Daughter dance. It might seem a little ridiculous, because in most cases I have only met the bride once and have never seen her father before, but it doesn't matter. The tears well up! Maybe it's because my dad isn't a very emotional guy and we didn't even do the Father-Daughter dance at my wedding. Or maybe it's the sheer thought of all that the bride's father must be feeling in that moment. Whatever it is, it gets me every time. Full disclosure: I didn't get to shoot Allyson and Will's wedding. Another Tie the Knot Videography shooter, Connor, did all the shooting and I edited the highlight reel and other clips. So I didn't have to hold back tears in person for this particular wedding, but even watching the footage back got to me. At one point Allyson's dad picked her up off her toes - just like he probably did when she was a little girl - and hugged her tight. I had to include that in the highlight reel, as you'll see below. And then another sweet moment got to me during the First Dance. Allyson and Will were whispering into each other's ears, which to me is one of the most romantic things in the world. And they were just beaming with smiles. It wasn't staged or forced for the cameras, they were truly in their own little world. Combine that with the song Allyson chose - "Hundred More Years" by Francesca Battistelli - and let the waterworks begin. I had never heard this song before, which is really saying something. I'm not sure how many highlight reels I've edited at this point, but it's a lot! Probably more than 50. So when a love song comes along that I don't recognize, I'm excited. Because I take so much care in editing each couple's highlight reel to fit their moments and my footage with their song choice, lyrics are a big deal to me. I like to sync everything up to create a goosebumps moment. For me, and hopefully for Allyson, this song provided a few of those. Imagine my surprise when Kiah, a sweet young woman from Houston, sent me an e-mail requesting my services for her "surprise wedding"! She explained: "The thing is... it's a surprise for our families. They think we will be attending a private wine tasting but we are springing a wedding on them! Are you OK with playing along?" Was I EVER okay with playing along. I adore surprises. Weddings make me so happy. And we get to combine the two?! I couldn't wait to help them pull this off. Around 4PM, Kiah disappeared upstairs to change from her day clothes into her wedding dress. She gave her dad the courtesy of calling for him after she was ready, and she then revealed to only him what was about to happen. A few minutes later, the officiant informed the family that they were not, in fact, here for a wine tasting. Kiah and her father appeared in the doorway of the porch with beaming smiles! Everyone became giddy and emotional - success. I breathed a sigh of relief, ha! This was basically the best April Fools' joke I've ever seen. Definitely beats that one time I put my boss' stapler in Jell-o... Congratulations Kiah and Shane! Thank you for inviting me to be part of your sweet, intimate day. ...Then Barry and Kristy will be together FOREVER. :) Kristy was so persistent in trying to wait out the rain, because Barry had built and decorated, by hand, a gorgeous arch for them to be married beneath. When I trekked out with an umbrella to see it, I could see why it was so important to her. There it was, in a field now full of puddles, in all its elegance. But the sky was dark grey and thick with clouds, and the ceremony had already been delayed over an hour. When Kristy was finally convinced that the show must go on under a white tent that was meant for the reception dinner, my heart broke for her. She was so disappointed. It was that moment I knew we had to incorporate that special arch into her photos and video somehow. Barry (who is Nathan Fillion's doppelganger, no?) and Kristy's DIY wedding had SO many adorable, sentimental details it was hard to fit most of them in their Highlight Reel. The barn wall adorned with photos of their loved ones who had passed on was really moving. Check out the reel below for some Southern inspiration, if not for their precious "First Looks" that always makes me smile from ear to ear. Kristy really overcame a lot on her wedding day! 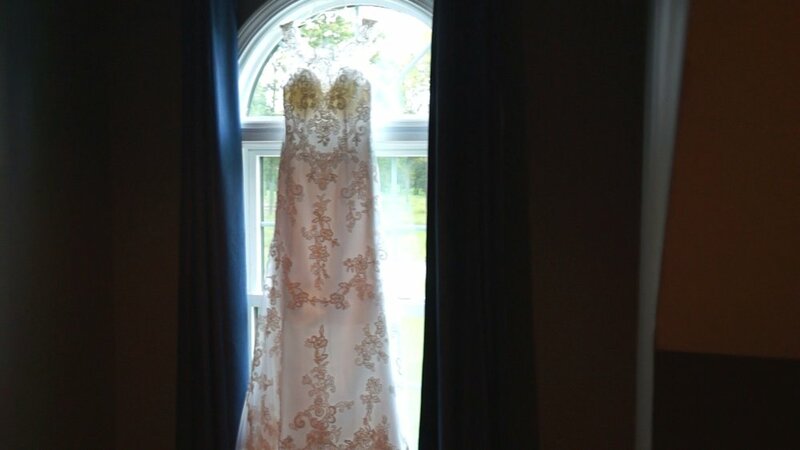 Less than ideal weather and a tear in her dress that had to be sewn up to name a couple. But to see Barry support her and try to cheer her up was a special thing. Once they had said their vows, the rain had gone from a downpour to a drizzle. After the ceremony I suggested we go out to the arch with umbrellas and take some photos and video. The photos turned out AMAZING and I love the couple shots I was able to capture on video, balancing an umbrella over my camera, too. The best compliment my former boss ever gave me was when he told me I was a great storyteller. It meant so much that anyone would think that about me, since telling stories - whether it be through writing, video, photos, etc. - is one of my absolute favorite things to do. I hope I lived up to that endorsement when putting together Jason and Bonnie's highlight reel. I feel as though I did, because I caught myself smiling while editing. Sometimes that is the greatest reward of doing all this: feeling a smile that has crept across your face without realizing it. Affirmation that you're doing what makes your soul happy. (I'm sure it also helps that they chose a Michael Buble song.) My account of the story that is August 8, 2015 begins with Bonnie arriving at Cheekwood Botanical Garden and Museum of Art with her mom and two sisters. It was a joy spending time with these beautiful, kind women as they got ready. The setting was classic and breathtaking, and Bonnie was truly stunning in her dress. It was as if that dress was made just for her! I absolutely loved her hair, too. 100% Pinterest-worthy. No first looks for Jason, which was definitely for the best because otherwise we may not have seen him shed tears as Bonnie walked down the aisle. That moment was ridiculously sweet, and still wasn't my favorite of the day. More on that later. THE FLOWERS. AT THIS WEDDING. I don't think I've ever seen prettier flowers. They were full and soft and romantic and made of everything you dream of when you're playing princess-bride dress up as a little girl. Just me? Okay... but seriously, I was a little obsessed. I shot so much footage of the flowers and tried to put them in the highlight reel as much as I could without feeling like it was overkill. But my favorite shots come from their first dance. Sure, it was obvious by then how in love they were. But during their first dance they seemed most themselves, just soaking in each other's presence. Just watch Bonnie's eyes light up in the close-ups. Smiles, whispers, laughs... it was like a scene out of a Nicholas Sparks movie. Magical. Please note: To view in HD, click the little gear icon in the lower right corner of the YouTube window and select "1080." Okay, I don't have a thousand reasons. But they chose "A Thousand Years" for their highlight reel and here's a few reasons to check it out: June 27, 2015 was a dimple-hurting happy day. That's how much everyone was smiling (including me). I love it when we get brides who are just so relaxed and literally blissful in their excitement and love. Ashley was one of those brides. She was living in the moment - an example of that was during their vows, upon repeating her part of the vows "I receive you as my husband," she thoroughly enjoyed every syllable of the phrase. I had to include that bit in the highlight reel because it was too adorable. Ashley was referred to me by another one of my favorite brides, Rita. You can read about her wedding here. My second shooter (read: husband) Chris and I were privileged to start the day early with the Ashley and Kenneth. We were able to capture the precious, happy moments of their preparations for the day. Their beautiful, care-free spirits set the tone for everyone. My absolute favorite moment was when Ashley walked down the aisle, seeing Kenneth's reaction. He shook his head in disbelief (I mean, she was a bombshell) and covered his mouth. This was the first of several times Kenneth held back tears during the ceremony. Their pastor did a phenomenal job officiating the ceremony with a smart, sincere message. Kenneth and Ashley had prepared personal vows for each other and drew plenty of "Awww's" from the congregation during their vows. At the reception, Ashley's sister had a special surprise for everyone. She read a heartfelt and at times laugh-out-loud funny poem to the new bride and groom, which walked everyone through her feelings about "giving her sister away." The sentiment was so sweet that Ashley requested it be used as part of her highlight reel. I love it when brides make suggestions like this - it helps me make your video even more unique. The finished product is below, and I hope it makes Ashley as happy watching it as it does me! Joe and Allyson tied the knot outdoors on May 30, 2015 - a Tennessee day with rain in the forecast that held off until the very moment the were pronounced man and wife. As the first few raindrops fell, Allyson became a little panicked. Truth be told, so was I. I didn't want to have to replace three video cameras due to water damage! But we must have both said a prayer that was answered because by the time the wedding party had marched back down the aisle to exit, we had just enough time to run for cover. Rain clouds aside, the day couldn't have been prettier. Allyson was an absolute vision in her vintage lace dress, and Joe's handsome smile always found its way to her. These two have personalities that truly complement each other. Allyson had warned me that she involuntarily makes silly faces when being photographed or filmed - but when Joe was with her, she seemed totally at ease. Chris + Kate... what can I say about this beautiful, sweet couple? I've been so blessed with genuinely wonderful couples to film, and they are no exception. One of the blessings about getting to do this job is being constantly surprised and reminded about how lovely people are. Being around them on their most special day is an inspiring thing! Kate was a gorgeous bride. Her look was romantic and soft, pink and poised; all of the things little girls want to be as they grow up dreaming of their wedding day. Her hair and makeup were flawless, making her features striking but not overstated. I later discovered that she creates her own makeup video tutorials. Girl knows what's up. Check her out! Chris is one of those grooms who only has eyes for his bride, and he was so affectionate to her from the first moment of their "First Looks." An interesting thing I've noticed about First Looks (including ours from my own wedding) is that, while brides spend so much time and energy over the details of the dress, hair, and flowers, grooms can't take their gaze away from their bride's eyes. Of course they eventually take in the whole picture, but during every First Looks I've seen the groom is less concerned with the details and more enamored with the bride just being there. You can see this was no exception, below. The ceremony took place in the courtyard at Cellar One in downtown Nashville. A beautiful, intimate setting with patio lights strung above and through the green trees. The reception followed inside, where highlights included a Southern-influenced menu complete with salad in mason jars and fruit pie for dessert. One of the classiest weddings I've ever been to, Corey and Anna's nuptials took place outdoors under the bluest October sky I have ever seen! The bride wore a perfectly cut wedding gown and the groom and his men wore grey - a look that I personally love. In fact, the gentlemen at my wedding wore grey tuxes :) Anna's brother officiated the ceremony, which not only added to the sentiment but also made for a few hilarious laughs (see highlight reel). Anna and Corey couldn't stop smiling for the whole ceremony. I've been so blessed to capture such truly happy couples! Anna has that smile that lights up a room and makes you smile right back. This was my first time shooting at Oz, which is a relatively new venue in Nashville. It has a very modern vibe, with contemporary art at every turn. Large, unique statues and pieces adorn the outdoor portion. Inside, the area where the wedding cake stood was surrounded by several dozen pieces. The dance floor was under a roof but it was all open-air so the cool Tennessee breeze flowed freely throughout the space. It felt very different than any other wedding venue I'd filmed at. Oz definitely has a lot to offer that is all its own. I was impressed. As a surprise during the reception, Anna and her father had prepared THE most fun father-daughter dance! I've posted it below the highlight reel because it's just too awesome not to share on its own. It's totally viral-worthy! I can only imagine how many hours they spent practicing. What a good sport her dad was! He had a ball. What a memorable, gorgeous wedding to have been a part of. I hope Corey and Anna will treasure their wedding video for years to come! Nate + Lisa pledge "All of Me" at the Loveless Barn! Nate and Lisa didn't let a few raindrops get in the way of having a gorgeous fall wedding that felt more like a big party! The spot for their "First Looks" was switched at the last minute to a covered location: The Parthenon. As you can see in their highlight reel, this provided a gorgeous, deep backdrop for the photos and footage. From there the bridal party traveled to the Loveless Barn on the outskirts of Nashville. This was Tie the Knot's first wedding and reception at Nashville's iconic "cafe," and it proved to be an ideal venue. Nashville Event Planning decorated with country-chic linens and centerpieces - they even had a S'mores Bar! The ceremony had a really special moment that stood out to me. Upon completion of pouring the sand in the vase, Nate and Lisa walked out to their parents and new parents-in-law, who were seated in the front row, and gave them all hugs. What a sweet way to cherish that moment and show a visual representation of two families becoming one. Immediately following the ceremony, the bridal party boarded a limo bus for a celebratory ride. They arrived back at the Loveless Barn to applause, dinner, drinks, and dancing! I love weddings where everyone just gets out on the dance floor without hesitation. And I can testify that Lisa has some legit dance moves! The night ended with an exciting exit lined by their loved ones and lit up by sparklers. So happy we were able to provide a full day of videography services for this super fun couple! Remember to view highlight reels in HD, click the little gear icon in the lower right corner and select "720" or higher. Meaco + Rita: High on Love! When Chris and I met Meaco and Rita at our consultation, I knew right away Rita would be a FUN bride to work with! She has an electric personality and smile; it's easy to see why easy-going Meaco was drawn to her. The wedding was every bit as fun and happy as we expected from that first meeting. As you'll see in the highlight reel below, their first kiss as husband and wife was simply adorable... followed by an all-out flash mob by the wedding party at the altar! Feel free to spread this video around so it will go viral ;) I have a feeling God has wonderful things in store for this beautiful couple and their sweet family. They are raising 3 gorgeous, sweet-mannered daughters - and they all performed an awesome choreographed dance as a surprise at the reception. It was delightful to see how Meaco kept Rita laughing all day long. We wish them all the best! THIS gorgeous couple was wed at Rose Mont Mansion in Gallatin, Tennessee. Savannah and Aaron were all smiles, all day! Which meant I had plenty of super sweet shots to choose from when putting their highlight reel together. Savannah chose the Economy Wedding Day package and added a third camera. That combination is my favorite example of how to get a great amount of video coverage for your wedding day on a budget! She will receive full 3-camera coverage of her ceremony, plus the highlight reel posted below, all on one DVD (or hard drive) without breaking the bank. I arrived in plenty of time to set up for the ceremony and shot details and exteriors. When the ceremony began, Aaron took his place at the front and he just looked so handsome, happy, and at ease. And when Savannah rounded the corner for everyone to see, the whole place was genuinely thrilled to see her on her wedding day looking so beautiful! Especially Aaron. For the duration of the wedding it was obvious that Savannah and Aaron's favorite place in this world is right next to each other, in their easy, natural love. The reception was a blast and the groomsmen kept the dance floor very entertaining (see video)! Aaron even busted out the classic "Lawn Mower" dance move. They had an awesome cake that said "Best Day Ever" at the top, as well as an ice cream sundae bar and cupcakes, which especially delighted little ones. Weddings like this remind me of how blessed I am to be afforded a job where I'm invited to participate in such special moments in others' lives. I really believe that it's good for the soul to be around happy people. My heart is full! *To view in HD, please click the little gear icon in the lower left corner of the video, and select "720" or "1080." Travis + Leigha Tie the Knot - in a CAVE! I had never been to - or heard of - the Lost River Cave just over the Kentucky border. But it is such a treasure! Travis and Leigha's ceremony took place by the creek just outside of the cave. The setting couldn't have been more romantic... roses and florals in pinks and reds, an elegant chandelier, and a setting that felt intimate and cool at the same time on a hot August day. Leigha was a gorgeous bride! I mean really, I could not stop looking at her beautiful southern belle curls and flawless dress that seemed like it was MADE for her. She told me that her mom and her made all of the decorations and floral arrangements. All. Of. Them. Clearly creativity runs in the family (her mom was also her photographer!) Travis was a tall, handsome, respectful groom. What a sweet couple they make! And they already have the cutest little boy. At the end of the wedding, he carried a sign down the aisle that read "They'll have cute kids." After the ceremony, the reception was held inside the cave. It was as awesome as it sounds! After shooting so many weddings I am continually amazed at all of the unique atmospheres I get to work in. Imagine having a party inside a cave! I wouldn't have thought about it unless I saw it myself. If you're looking to get inspired for your own southern-chic wedding, check out the highlight reel below! And for more information about Lost River Cave, click here. Nick + Paige's Pinterest-Worthy Wedding! What a treat it was to film these two all day! Nick was just the sweetest guy and Paige looked like the very definition of a Southern Belle. Have you ever been lost in Pinterest, caught up in admiration for the adorable, creative ideas people have for weddings? THIS was one of those weddings - where every detail was so thoughtful, so perfect, so intentional! My type A/Monica-from-"Friends" personality was in heaven. Their theme was what I would call Southern-vintage in peach and mint hues. For the outdoor ceremony, cucumber water and strawberry lemonade were served as guests took their seats in front of a large tree, with different picture frames hanging as the backdrop. The bridesmaids each wore a different dress in a different shade of pastel. The wedding cake was bright and gorgeous, the reception hall was romantically lit and featured different centerpieces at each table featuring vintage-looking trinkets like clocks and old cameras. On David and Becky's wedding weekend, there was no lack of sincerity and sweetness. They invited us to capture their rehearsal dinner and entire wedding day, and the whole thing was simply beautiful! The first thing that became apparent to me was how close both of them were with their families, and how respected Becky's dad was among the entire group of their friends and family. Chris and I so enjoyed getting to know him and catch his personality on video. The wedding day began at the home of Becky's aunt - what a gorgeous place. It was perfectly located near the Brentwood Country Club, where the ceremony and reception took place. I love that David and Becky wore their custom Nashville Predators jerseys for some of their wedding photos! Destination: Punta Cana! Tommy + Nikki "Tie the Knot" in the D.R. Okay, so I'm a little biased with this one... our dear friends invited us to come out to the Dominican Republic to film and photograph their wedding. * They would tie the knot at the Iberostar Bavaro resort in Punta Cana. The soft, white sandy beaches of the Dominican Republic provided a breathtaking setting - I mean, I really didn't think water could be that color turquoise unless it was Photoshopped. This was our first destination wedding but I certainly hope it won't be our last! I've known Tommy for about as long as I've known his sister, one of my best friends (and Matron of Honor) Maddie. Tommy is a gem of a guy. Their whole family is among the kindest, most supportive people I've ever had the pleasure to know. And the first time I met Nikki - I'll never forget - I couldn't get over her gorgeous hair and big smile! She's the kind of girl that lights up a room and the kind of girl you immediately want to be friends with. You can't help but notice that in their highlight reel. *Tie the Knot Videography does not typically shoot wedding photos. Here's our latest highlight reel! This gorgeous couple had a very special wedding day. Ashley looked like she stepped right out of a bridal magazine, am I right?? The reception was held at Boundry in the private space upstairs!